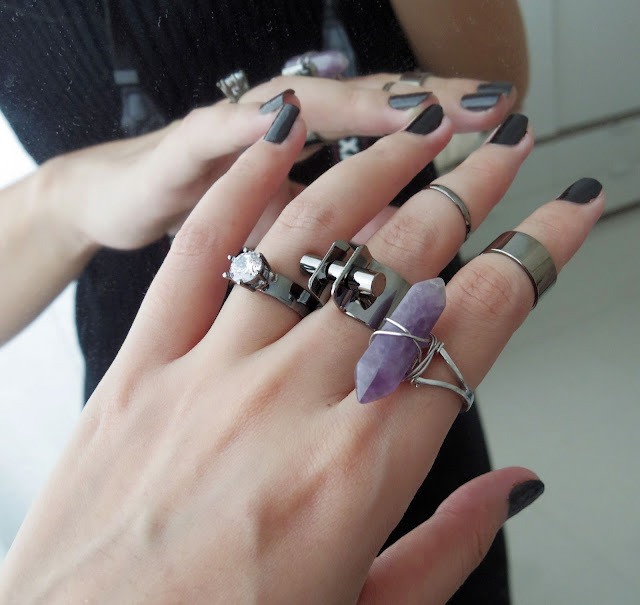 I was looking for accessories with natural stones all over physical shops and all over the internet. Then guess what, the usual, trusty Born Pretty Store did not disappoint at all! They even had both colours I was looking - milky white and purple! Also, there was a really kawaii set of four punk style rings which really caught my eyes. Ended up getting the rings set and a purple natural stone ring and feeling really accomplished! These 2 different set of rings simply complimented each other so well I could cry! For a waaaaaaaaay too reasonable price, everything was so beautifully made. There was even a clear stone (far left) for the set of four rings! The purple crystal (far right) which had a very even and soft tone, was nicely bounded onto the ring. Initially I thought the ring was running a little huge for my bony fingers, and then I realised it is adjustable! Ahhh salvation. Enter coupon code "LEET10" upon check out at Born Pretty Store for 10% off regular price items + shipping is free! Actually I got a whole load of stuff for myself from the store and I'll be posting a couple more of these awesome loot next!